Android library projects. We can get any standard Android project to act as a library by activating this property. The library can be imported into any project that needs to use it. The library project is distributed with its source code and resources. To read a complete description of library projects, see the official documentation here. JAR files. A .jar file contains the compiled classes. The source code can be included in it or not. We can’t share Android resources using a .jar file, just code classes. The decision to choose between one of them depends on our requirements. Do we want to share xml resources? Do we mind sharing the source code? A library cannot be distributed as a binary file (such as a JAR file). This will be added in a future version of the SDK Tools. 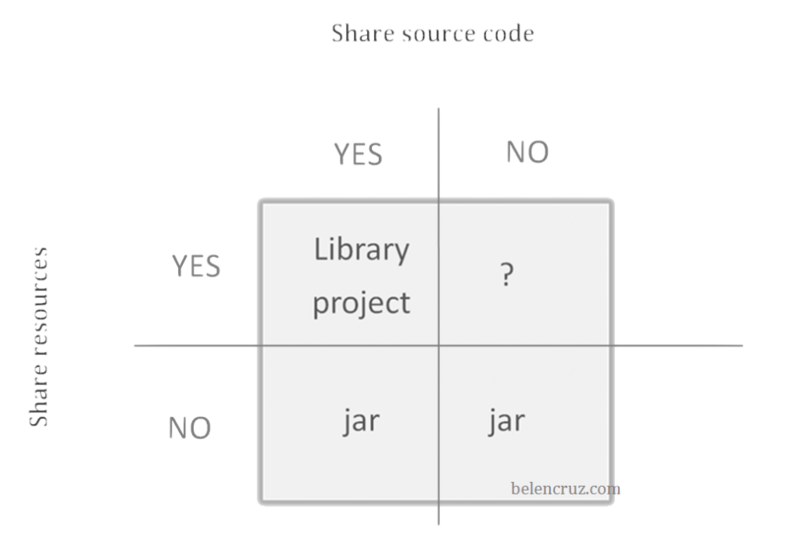 Create a Library Project to include the resources, but include the source code using a JAR file. Create the resources programmatically instead of using the XML files and export it to a JAR file.